Personalized Gifts for Golfers under $50. 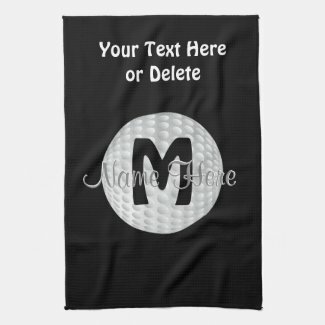 Easy to just type Your Name, Monogram or Your Text into text boxes on the Custom Golf Gifts product page or delete it. 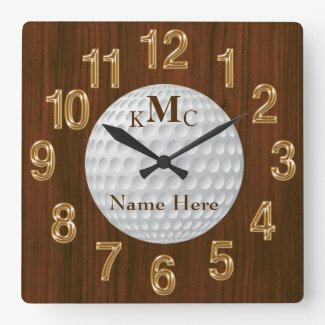 I can place any of our golf designs on ANY of our hundreds of quality Zazzle personalized gifts for golfers. We even have Monogrammed Golf Ball Sets. I will create a new customize it for you. Call Linda for Changes or HELP: 239-949-9090. Custom Golf awards are great golf gifts for dad, grandparents and golf retirement gifts. Type in YOUR Special and personalized message. Make it a funny golf gift or serious, it’s all up to you. How about for your Dad being the greatest dad of all time. Your Text. It doesn’t have to follow my suggestions. I can make changes for you too. CALL Linda: 239-949-9090. 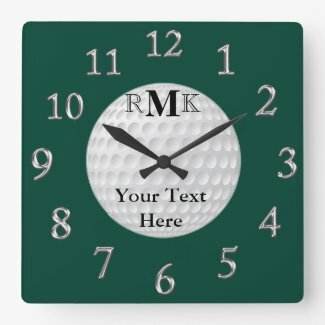 The first Golf Wall Clock background and text COLOR can be changed. Instructions to customize are in the Design Description area on the product page. The second custom golf clock has a faux cherry wood background. 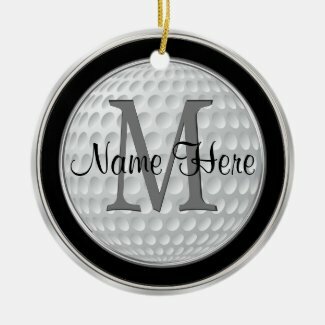 CALL Linda if you would like me to create golf decor gifts, inexpensive golf gifts for men and women with your colors and text. Free design service. You will see your golf gift before you decide to purchase it or not. Linda: 239-949-9090. Many of the gifts have different price, style and size options to fit most budgets. If you don’t see what you are looking for, please feel free to give me, Little Linda Pinda, a call. Zazzle has hundreds of different products that are customizable by you or by me. I offer a free design service with no obligation to buy. Zazzle offers a 100% Money Back “Love It” Guarantee to buy with assurance. A+ Better Business Bureau. We offer inexpensive to modestly priced custom golf gift ideas for men and women, boys and girls. Please give me, Linda, A CALL for golf design changes, color changes or other help creating customized golf gifts.